M43 jacket. Note how the shoulder loop is attached at the back of the shoulder and folds forward over the shoulder. With the shoulder tab unbuttoned it shows that the seam of the shoulder runs slightly backwards. A detail often overlooked with the reproductions. Three sleeves of the M43 jacket shown together. Note the color (od#7) of the fabric and styles of the buttons. Exception to the rule. 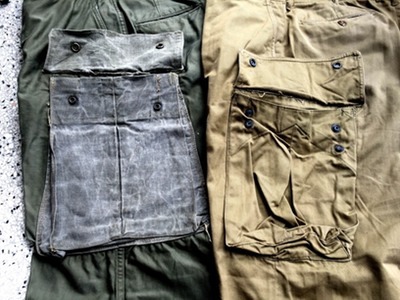 The gliderman on the left has a pocket from a M42 coat sewn to his M43 jacket's sleeve. 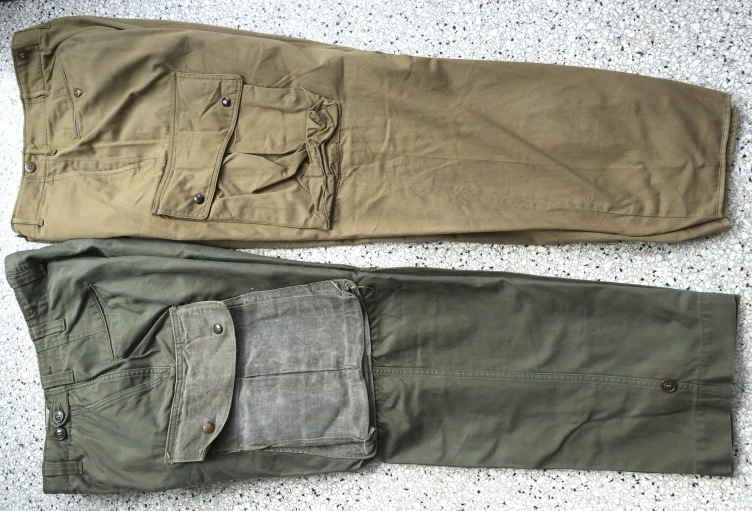 A modified M43 trousers (bottom) compared with the M42 jump pants. Details of the leg pockets. Left the (sloppy) riggermade pockets for the M43 trousers, right the M42 trouser pockets. Most 48 starred flags are the "parade" flags that were made during WW2 for every occasion, except for invasions. Armbands are worn by 101st troopers. Both the full and the cut off styles are shown here. Note that the trooper on the left has the outer suspender straps not attached, but left hanging loose for use with the mussette bag. Here the outer front strap of the suspenders is attached to the mussette bag in the correct manner. Underwear that was used by the paratroopers in WW2. All the green stuff is regular issue, but the white T-shirt is civilian (with a laundery marking). 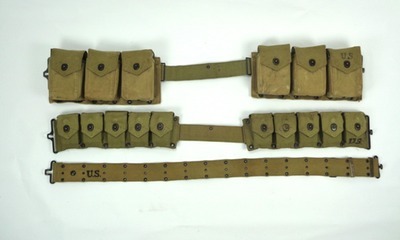 Standard equipment belts used by the US Army in WW2. 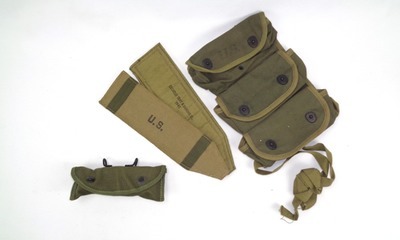 Top: M1937 BAR belt, middle: M1923 rifle belt, bottom M1936 pistol belt that was also used for the carbine, Thompson/M3 submachine gun and by the medics. Flimsy cheap yellow crap. Obviously this is going to ruin your impression. Ever wondered why it's so cheap? Besides just weird looking, the middle row of grommets should be of a smaller size grommets. Don't spent your money on this! There arent even top grommets to attach your suspenders to! Left a M1916 holster for the .45 pistol with on the right a M3 shoulder holster. Also shown is a magazine pouch of WW1 vintage and a waterproofed pouch holding a compass. Equipment like the wire cutters was widely used by the paratroopers, the cleaning rod for .30 caliber weapons can be seen sometimes as well. 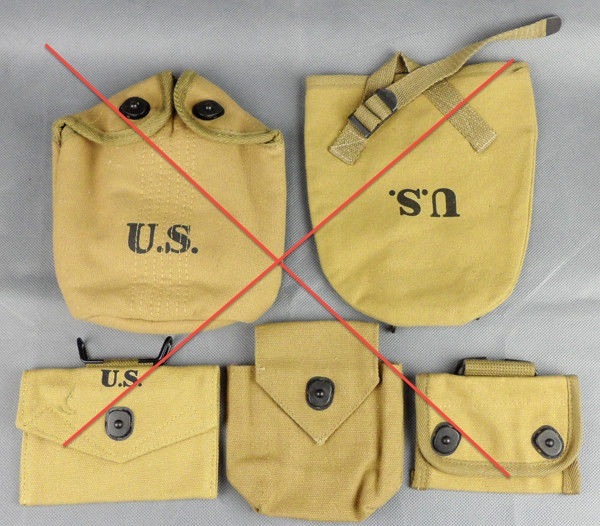 The three pocket pouch is for carrying three hand grenades (often mistaken for a medical pouch) and was not used by the troopers. The muzzle cover is only seen in original photographs used by rear echelon personnel issued with a carbine. Some of the equipment that is still easy to find, but that was not yet in use in 1944. Exception to the rule. A 3rd armored division soldier sporting an "Amish" beard. Note the civilian wristwatch. Every year the airborne part of the Market Garden operation is commemorated in Holland. More and more reenactors are participating every year in all these liberation events. Often portrayed are the Parchute Infantry troopers of the 82nd and 101st Airborne Divisions, British and Polish paratroopers are portrayed as well. 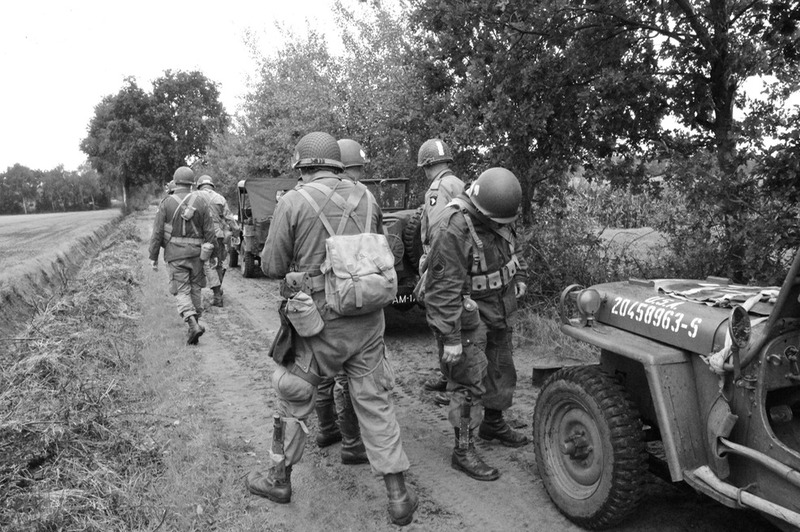 Since the release of the excellent mini series "Band of Brothers", the majority of reenactment groups like to portray Easy Company, 506th PIR. 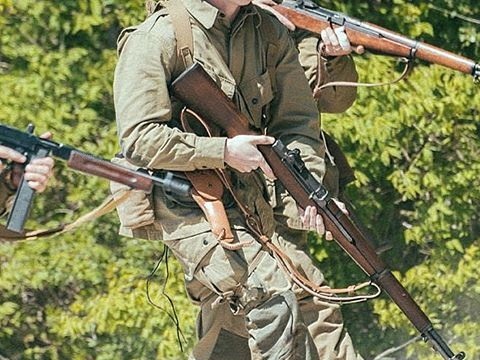 Working with the Dutch "Band of Brothers" (BoB) reenactment group, we thought it would be handy to make a Do & Don't-list of the uniforms and equipment. We also would like to point out what to look for when using reproduction uniforms and equipment. Especially the color of some of the cheap copies are abominations. Most importantly: Less is More! Avoid clichés, don't overdo it. Better to stick to a good basic uniform and equipment set. Study original photos of the impression (rifleman, radio operator, medic, et cetera) you would like to portray. There's nothing wrong with reproduction uniforms and equipment, as long they are quality. It is better to spend one time a little extra money then to buy cheap stuff that looks ridiculous and will break with first use and in the end you'll have to buy it again. Before buying reproductions it is better to study and compare original equipment. Visit a collector who'll be happy to show you and advise on uniforms and equipment. It will save you a lot of money in the end. 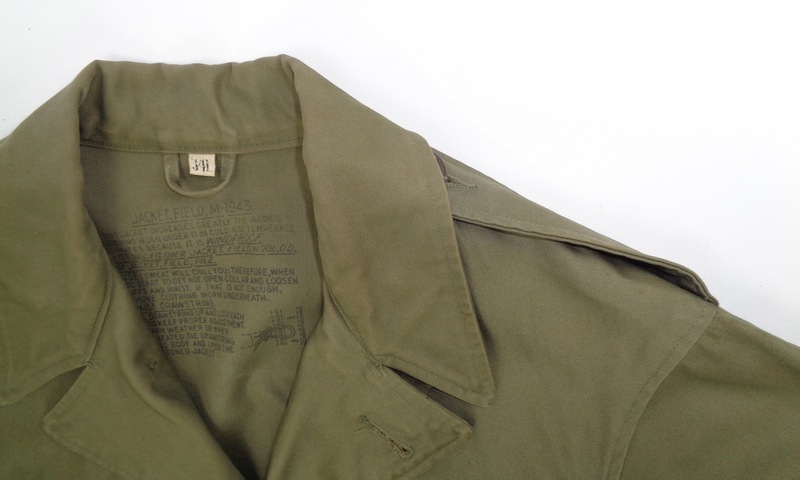 M43 Jacket: The M43 uniform was developed as an all-round combat uniform. 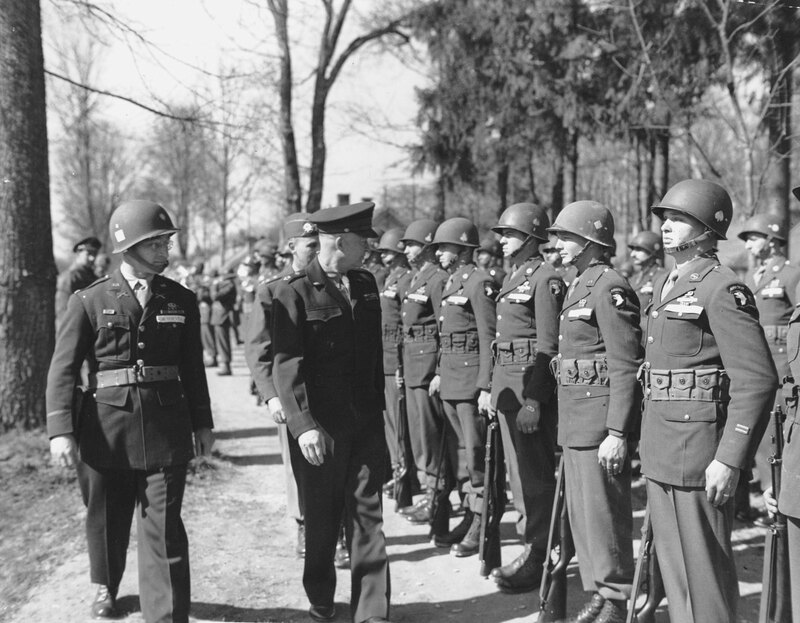 This uniform would replace all specialized clothing, including the "M42" Parachute uniform. A near mint M43 uniform set with a cutter tag still attached to the jacket. Note that the tightening flaps on the waist of the trousers are pointing forward. Post-war production had these pointing backwards. Although the jacket was issued without modifications, some troopers did made some alterations to the jacket. 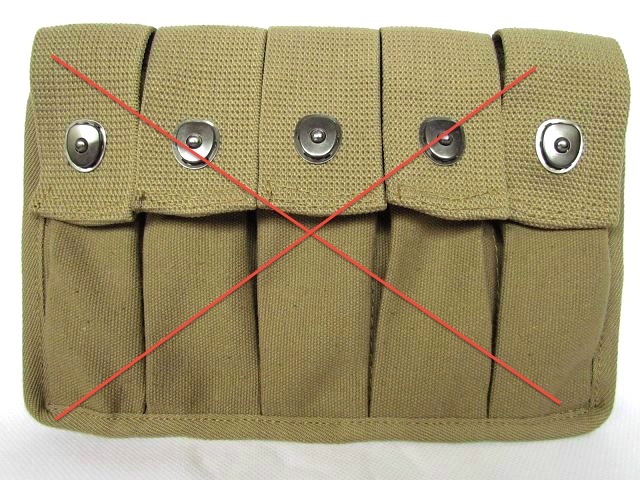 Major Winters of E Co. had a zippered pocket installed on the back below the waist, so that maps could be carried. 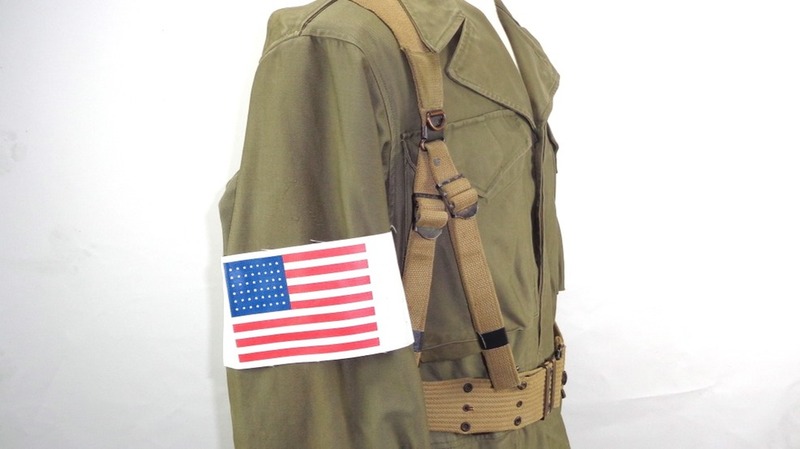 Some troopers added pockets from the M42 jacket to the upper arms of the M43 jacket, like they did before the Normandy Jump. The added pocket was, however, of little value and it is rarely seen with the M43 jacket. On the left shoulder the Divisional Insignia was worn, the "Screaming Eagle" patch with the 101st and the "All American" patch with the 82nd. On the right shoulder the troopers wore an invasion flag for identifying the parachute soldiers as Americans to the Dutch people. The 82nd Airborne Division took to wear a small American flag, printed on gauze, ever since the invasion of North Africa. For the Market Graden operation the 101st Airborne Division was issued a brassard made of vinyl coated cotton (often referred to as "oil cloth"). Pictured here are four original "oil cloth" brassards. This type of armband was issued to the 101st AB Division for the Market Garden operation. 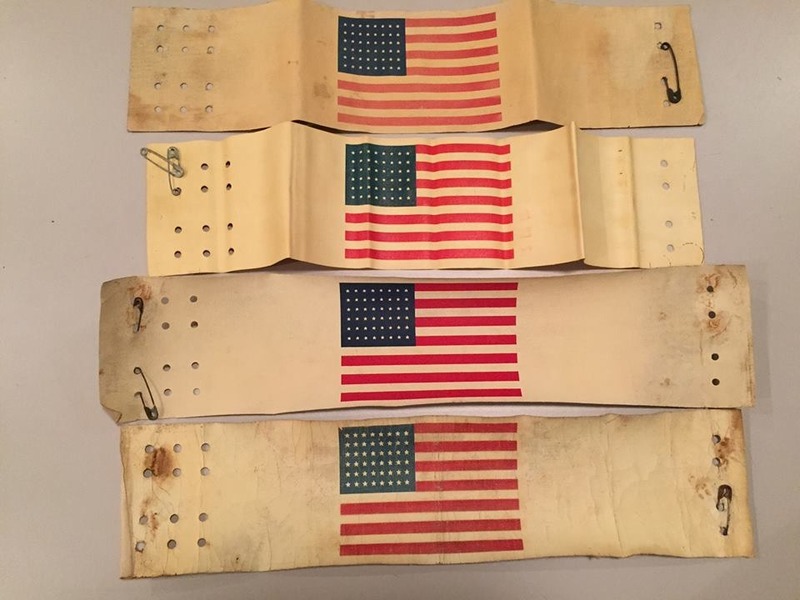 This white armband had the US flag printed on it and holes punched at the ends through which two safety pins could be fastened securing the band around the arm. Close-ups from photo reveals that most troopers folded the parts left and right of the flag inwards and pinned the complete folded armband to their sleeve. Some troopers cut the folded flaps off. Here the flag armband (repro) is worn as issued around the upper arm. 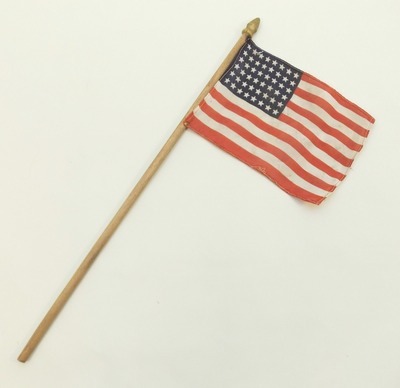 This flag was worn for a couple days after the invasion, but was less common after a week or so. The 101st was not issued, or used, any other types of flags. Most flags with 48 stars found today are small parade flags. These were rarely used by the military in WW2. 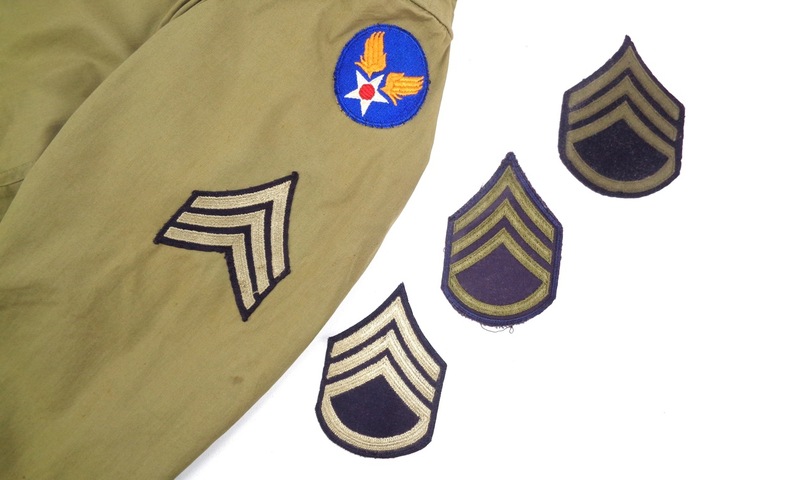 Rank insignia was used with the combat uniform, but it should be pointed out that rank stripes with a distinctive blue background are post war. Officially the background of WW2 stripes are a very dark blue, in practice this appears black with sometimes a slight hue of blue. Of the three Staff Sergeant stripes the middle rank is from the Korean war period. The top one is made of green wool sewn on black felt, the bottom stripes (like the ones sewn on the M41 jacket) are rayon on a background that appears black, but have a deep dark blue hue in daylight. The 1950's rank insignia have a more pronounced blue backing. 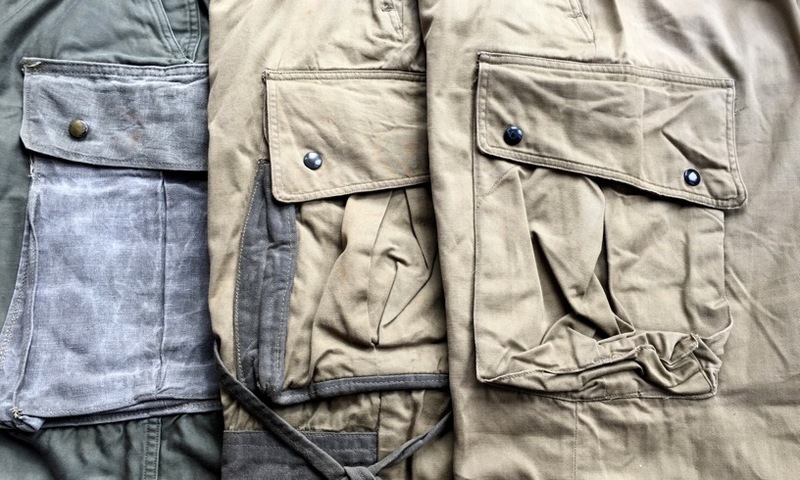 M43 Trousers: The pants were altered by adding a set of large thigh pockets. 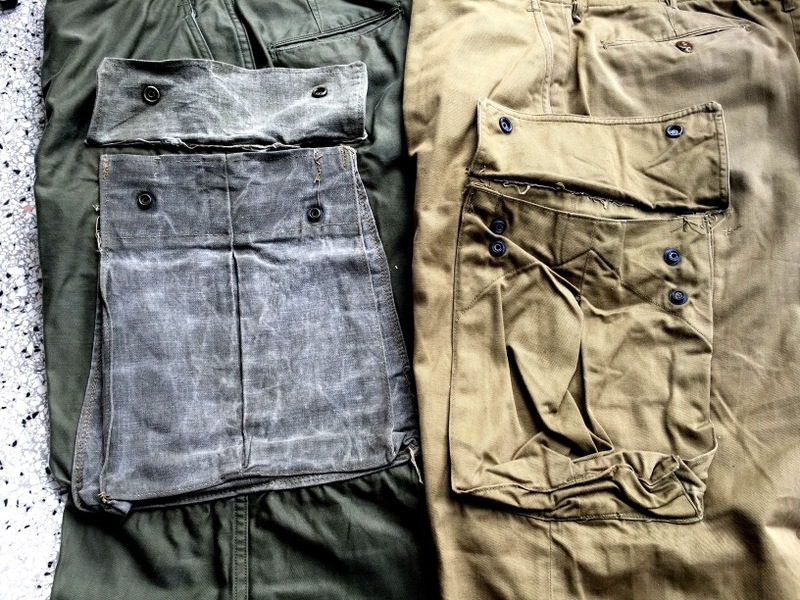 These pockets were made of sturdy duck canvas that were cut from new rolls of fire retardant OD canvas. This is the same heavy material that the M42 jump suit reinforcements are made of. Here are shown the three versions of the Jump pants. 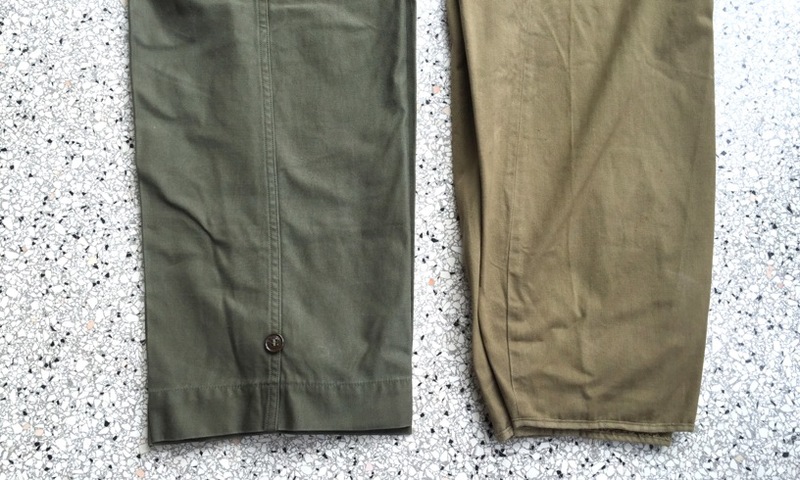 Left is the M43 pants with the canvas pockets added. In the middle are unused modified M42 pants as used in the Normandy invasion. 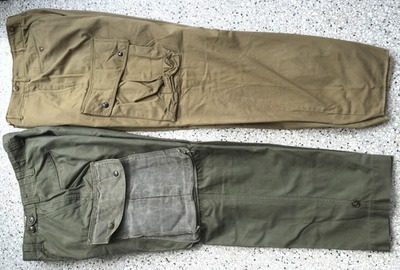 Right is a mint unaltered M42 jump pants. 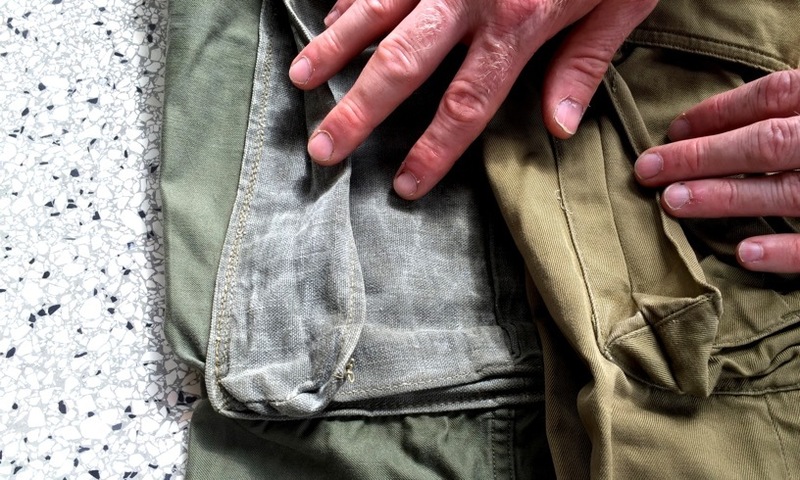 Note how the treated canvas of the M43 pants is faded after washing compared with the mint modified M42 pants. 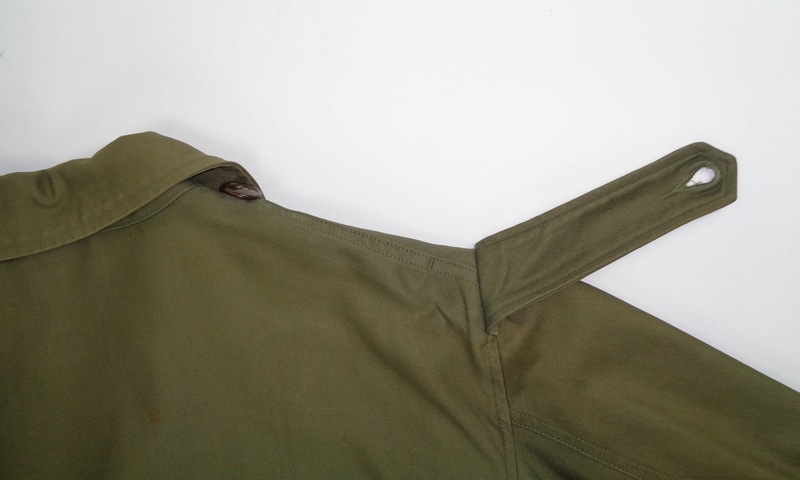 The patern of these pockets were copied from the M42 jump pants, albeit slightly larger. These pockets were made by the rigger sections of the Airborne Divisions and may vary in size and shape. Some pockets have beveled flaps, others square flaps. These flaps were closed by friction snaps. Some pockets have two sets of male snaps like the M42 jump pants. 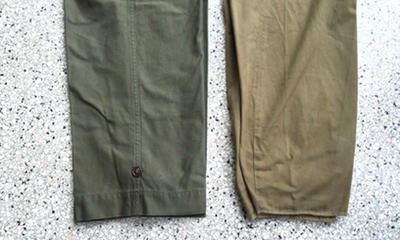 Often reproduction jump pants have the pockets reproduced in a grey-ish green soft cotton "canvas" with the fold along the sides stitched as well. Although this was done by the manufacturers with the M42 pockets, it was not done by the riggers when making these pockets for the M43 pants. The pockets for the M43 pants are made without the bellows fold stiched as can be seen with the M42 pockets. When washed the pockets would loose their color pigment, due to the retardant chemicals, and the white of the canvas will show through, giving the pockets a grey appearance. Occasionally, pants can be found with a large reinforcement patch sewn inside the leg pant to prevent tearing where the heavy canvas is attached to the pants. This was probably done after the Holland Jump when new M43 pants were altered by adding the pockets (now with backing patch) and straps. This patch was usually made of HBT material. A strap to tie the pocket to the leg to prevent swaying when running was attached to the inside of the leg. With the M42 pants the 101st used exclusively a 3/4" fabric tape and the 82nd used straps made of the same canvas that was used for the reinforcement. 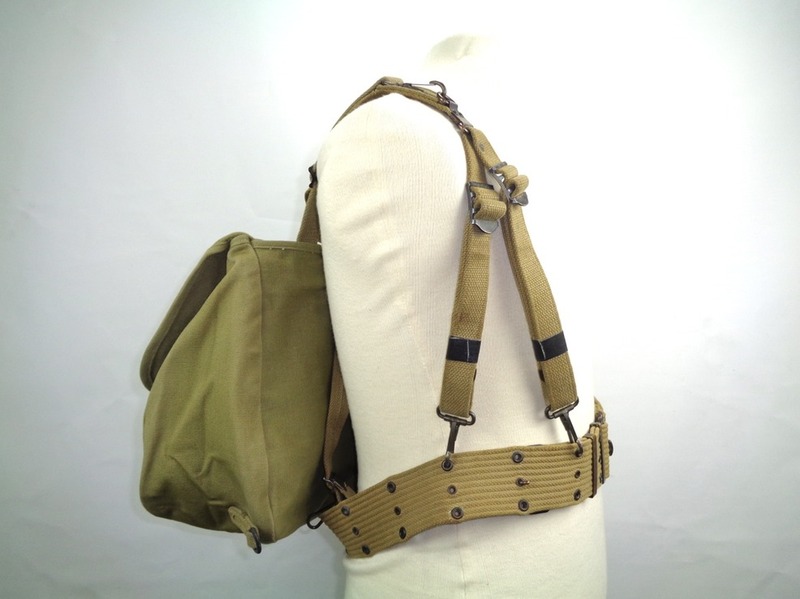 Both styles of modifications were used with the 101st, although due to shortages of the 3/4" tape, the canvas straps are more common. Four types of trouser suspenders used with the jump pants. 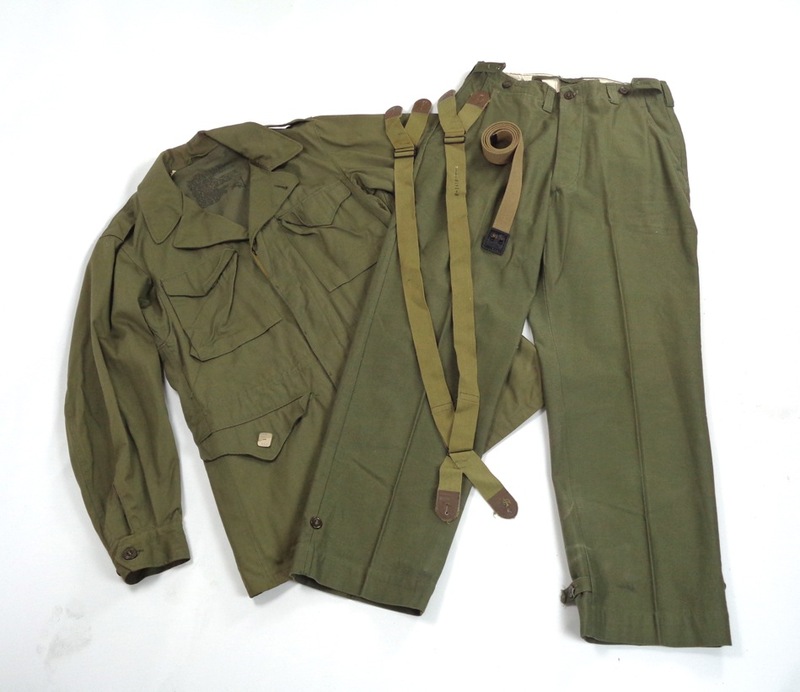 The top set is the early army version (simular to the USAAF version) and was issued with the M42 pants. The other three sets are of a simplified construction introduced in 1943. Pants are worn with the regular webbing trouser belt or suspenders, sometimes both. Original suspenders might appear too short for modern standards. Not only were people shorter in the 1940's, but trousers of the 1940's have a high rise and the waistband is generally worn above the hips, right under the belly button. (Modern trousers are lower and are worn under the belly around the hips.) Cheap reproductions are often made after a modern cut and are an ill fit. Under the M43 jump suit the regular wool uniform (shirt and pants) is worn. Due to a shortage of M2 outer shells regular M1 outer shells were issued. When ever posible these M1 shells had the chin straps replaced with the extended paratroopers version. Replacement M1 shells were usually unaltered. For the Holland jump new helmets were issued to replace the lost or damaged ones during the Normandy jump. Most of these new helmets came with a new production of the jump liner. The A yolks were of an OD (olive drab) color and had green painted cast buckles. Some had the new special webbing chin straps. The outer shells were standard M1 shells with the new swivel bales. occasionally the straps were replaced with the extended ones. Only later in the war factory made jump outer shell (with the swivel bales and extended straps) was standardized as the M1C. After the jump most troopers tucked the A yolks (with the chin cup) inside the liner under its suspension. It goes without saying that the M2 or any M1 variety is correct for the Holland Jump. Glider troops wore the standard M1 helmet. In Normandy the 101st predominantly used helmet nets of the 3/4" mesh type. Some units used the nets as issued, others added burlaps strips to the net to break up the silhouette of the helmet. After Normandy lost helmet nets were replaced by nets with a smaller mesh. These were taken from British stocks. In Holland both types can be seen. The large 2" mesh nets are not used by any troops in the ETO. Stop putting packs of cigarettes or other stuff, like yellow mine flags, under your helmet nets! Left: the fine British mesh. Right: the 3/4 inch mesh. I take it for granted that the markings used by the 101st on the helmets are well known already, so I won't go into this. The pride and joy of the paratrooper were his jump boots (Boots, Jumper, Parachute). This sets him apart from fellow soldiers. When the new combat boots (Boot, Service, Combat, Composition sole) was introduced, no more jump boots were procured. The jump boots that were still in stock were issued until exhausted. Many new replacements wore the new combat boots. After Normandy paratroopers were issued a new pair of these combat boots and were told to wear these on the next mission. Most troopers ignored these orders. Most likely those who did wore the new boots, did so to save their jump boots for wear with the class A uniform. 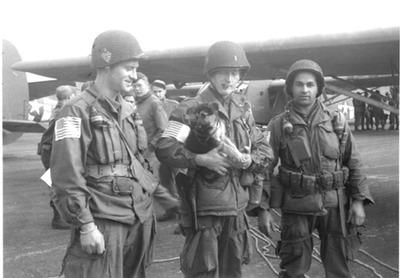 The glider troops used the old shoe-and-legging in Normandy, but upon return to England they also recieved jump boots (and a $50 raise) in recognition of being a combat partner in the airborne team. In the U.S. Army of WW2 no T-shirts were issued. Standard underwear comprised of shorts and a sleeveless under shirt. Pre-war underwear was white, but later these were produced in olive drab. The U.S. Navy did issue T-shirt as did the Marine Corps. The navy issued white skivvies throughout the war, the Marine Corps later issued green underwear. 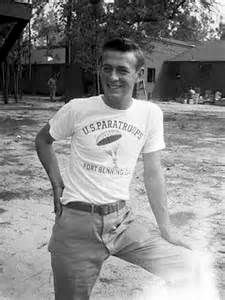 Special branches of the army, such as the paratroopers, did wore T-shirts that were printed with a design for that particular branch. The use of these T-shirts fell with that particular organization and were local procurement. These T-shirts were bought from civilian sources and printed by commercial firms as ordered by an organization or unit. 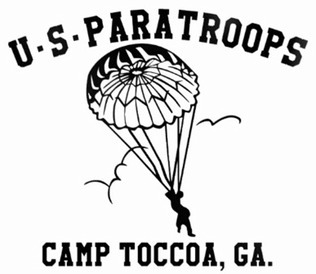 The T-shirts with the name "paratroopers" and a drawing of a parachute are well known. 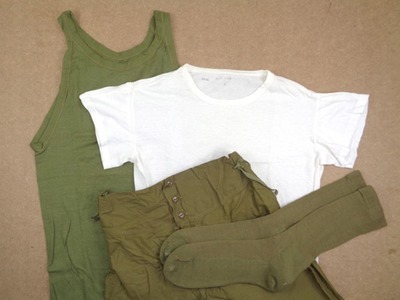 A lot of soldiers bought white T-shirts (and shorts) while on leave for use as extra underwear. WW2 T-shirts are different from modern T-shirts. Original shirts are of a tight fit. The body is usually of tubular construction, meaning that there is no side seam. Short sleeves with the hem of the sleeve ending high upon the upper arm. And, most importantly, a wide round opening for the neck with a thin border usually made of the same material as the body. In Holland these are sold in the C&A stores, aptly named "American T-shirts". Right style, right color (white) and cheap. Please, no more modern "army" shirts in tan or green with chocking necks with thick borders and sleeves like a medieval magician! 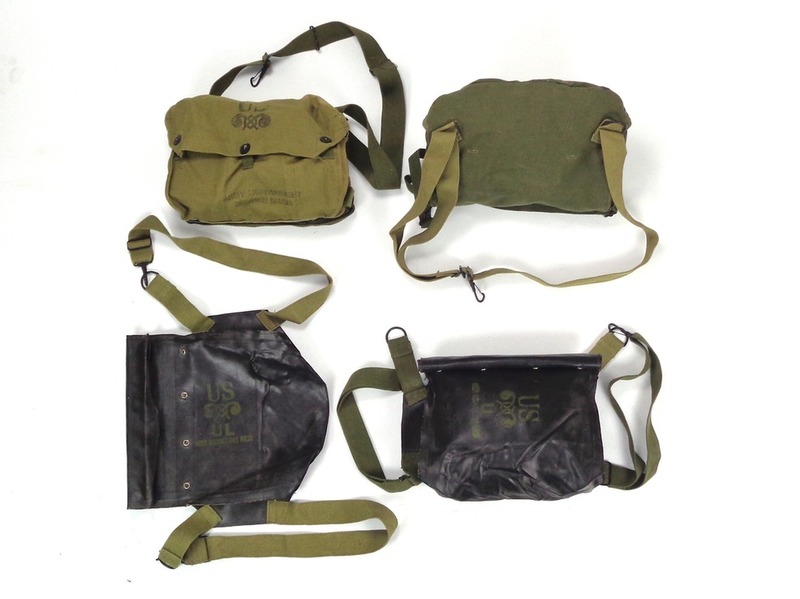 Gone are the Air Corps pouches that were used extensively in Normandy. 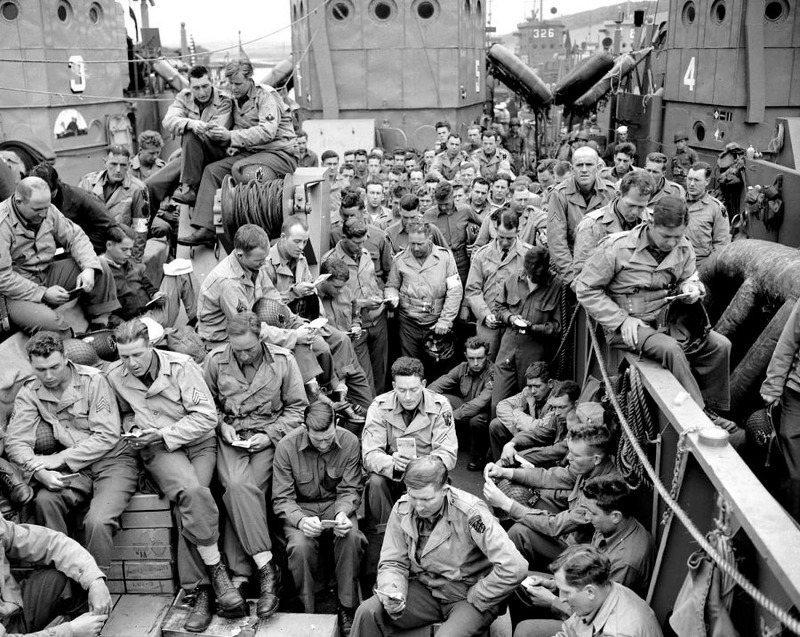 The flimsy pouches weren't practical and were generally discarded after Normandy. (But yes, some troopers still used the pouches.) 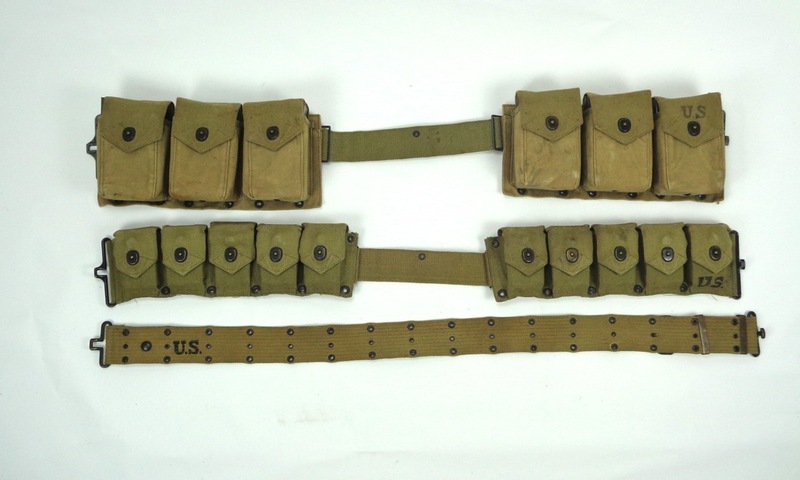 The majority of the riflemen opted to use the regular M1923 cartridge belt to carry the 8-round en-bloc clips. 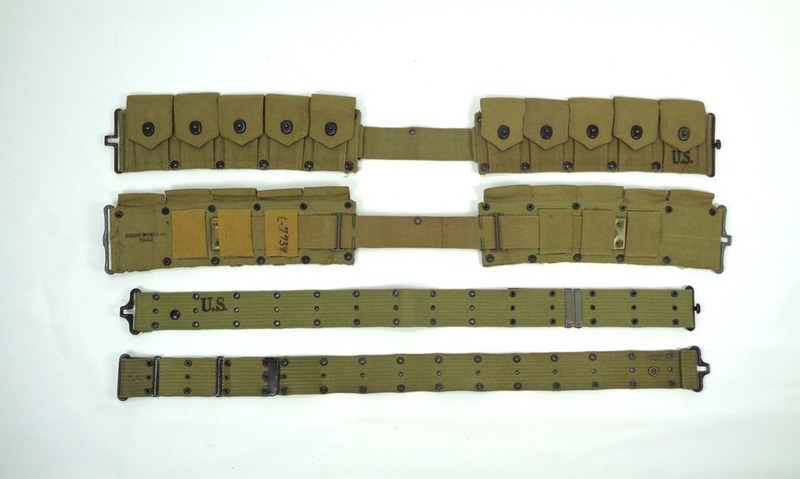 The mounted M1910/M1923 cartridge belts were already phased out before the Normandy jump. Some wore the pistol belt and carried their rifle ammo in bandoleers. Fronts and backs of the M1923 cartridge and M1936 pistol belts. Compare these with that flimsy crap that is made in China. Usually with the cheap reproductions the size and setting of the grommets or wrong too. Basic equipment worn on the belt is the first aid pouch with bandage and wound tablets. 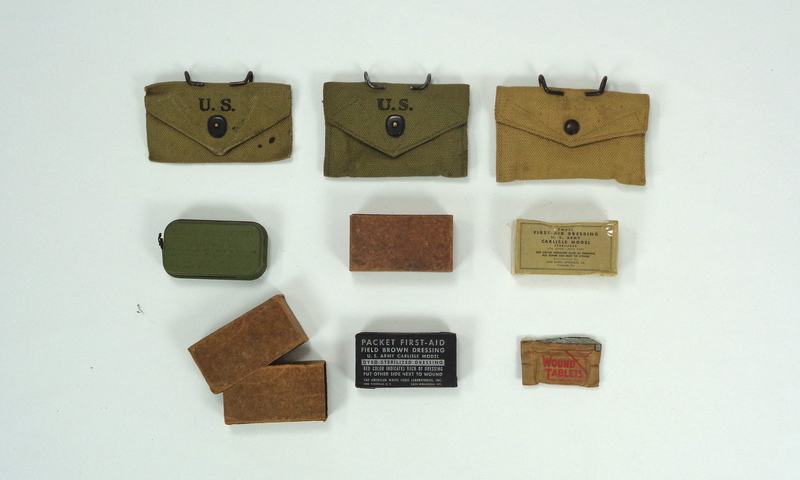 Top row: M1924 pouch (could only hold the smaller bandage packed in a tin. ); M1942 pouch (larger to hold the bandage now packed in a carton) and a British Made pouch. Centre row: The Carlisle bandage packed in a tin; a bandage in a material saving carton box (shown opened below) and a bandage packed in a cellophane wrapped carton. Bottom row: The telescoping carton that holds the bandage packaged in a black waterproof wrapping and next a small package with six wound tablets. When first organized, the paratroopers used a lot obsolete mounted (cavalry) equipment. Old hands were issued the mounted canteen cover with its reinforced hanger, but when needed replacement the standard M1910 cover was generally issued. In Holland the majority were of the standard type. The canteen used could be either the aluminum WW1 style with an aluminum cap, or the WW2 stainless steel type with its black plastic cap. Canteen styles used by the airborne troopers. L to R: M1941 Mounted cover; mint od #3 M1910 cover; M1910 cover with side seam produced from 1942 on; Stainless steel canteen with 2nd type plastic cap; Stainless steel canteen with 1st type flat plastic cap and an WW1 aluminum canteen. An entrenching tool was carried in its specific carrier. 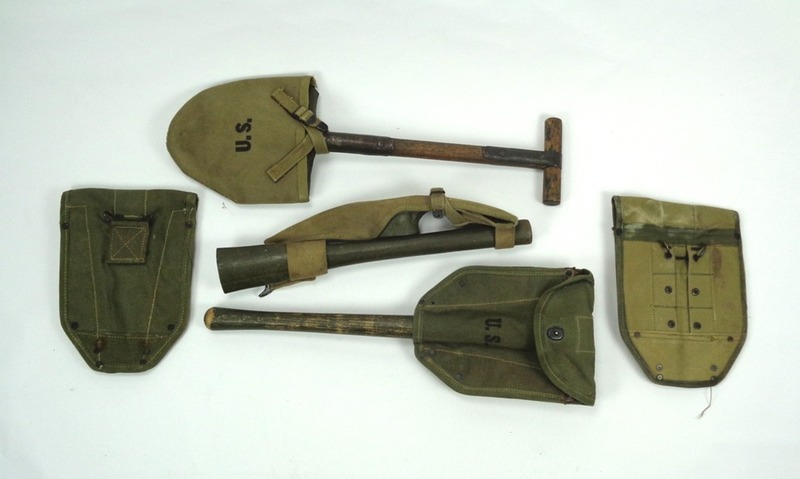 The M1943 folding shovel largely replaced the older M1910 T-handle shovel and the M1910 pick mattock after Normandy. Some troopers were issued a small M1910 camp axe that could be carried on the belt. Even an odd M1942 machete can be seen in original photos. Shown here are the three types of entrenching tools used by the troopers. Left can be seen the back of the 1st type of M1943 shovel cover, right the second type. Riflemen also carried the M1 bayonet on their belts for their M1 rifle. Personnel armed with carbines wore two to four ammo pouches on their belts. 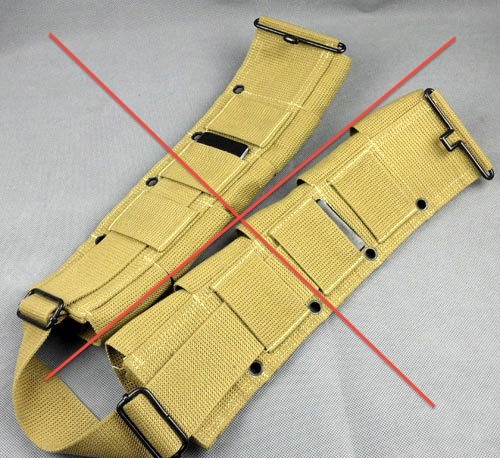 These could be the older type designed specifically for the carbine, or the new style pouch that could hold either two 15-round carbine magazines or two 8-round en-bloc clips for the M1 rifle. By September 1944 a good mixture of od #3 and od #7 can be seen. 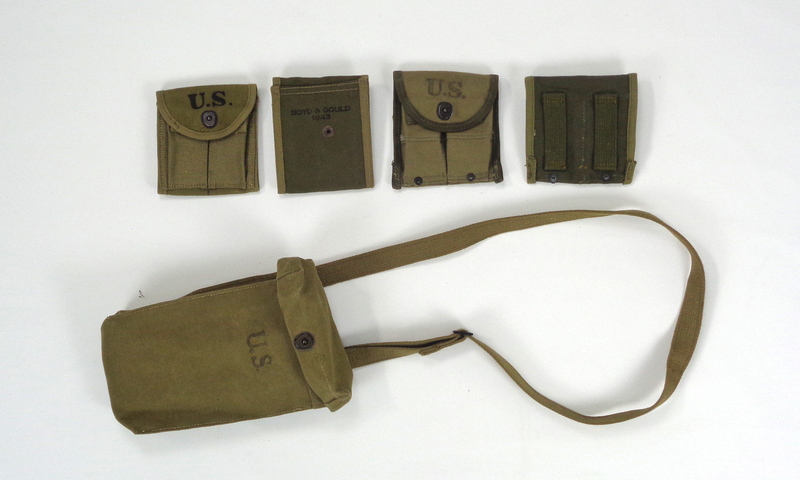 Illustrated above are the fronts and backs of the two types of carbine pouches used. Below these is shown a bag used for the Thompson 30-round magazines. For the Normandy jump either the five cell pouch for the 20-round magazins for the Thompson sub-machine gun were used or the seperate bag that held the longer 30-round Thompson (or Grease gun) magazines. It appears that in Holland the 5-cell pouches are barely used anymore. 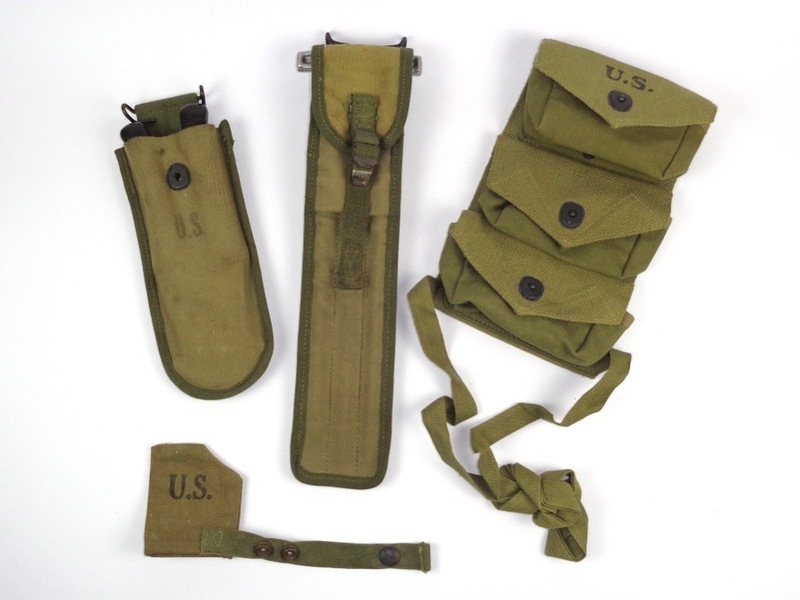 The longer 3-cell pouches were made for the Marine Corps and are marked USMC on the back. These were not used during WW2 and were certainly not used by any paratrooper. 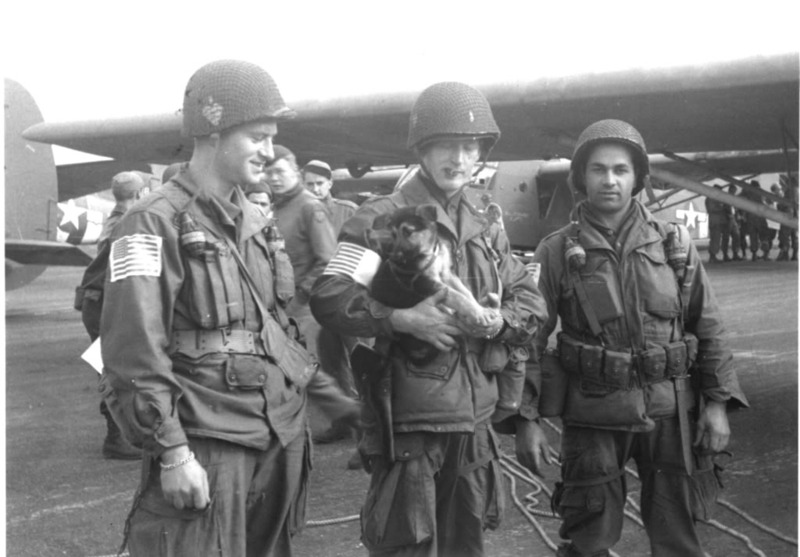 Although BAR's were added to the TO&E of the parachute infantry after Normandy, they are not often seen on photographs. 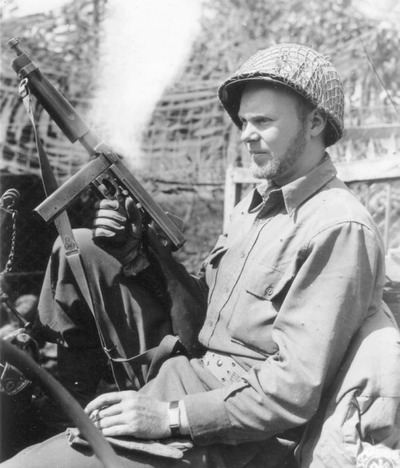 Airborne Infantry usually relied on the M1919A6 machine guns. Because the BAR and its ammo load was to cumbersome to jump with, they were dropped in equipment bundles. Since every man jump with a personal weapon, it was only that when the bundles were retrieved that the designated BARman switched to the BAR. In conjunction with the belt the M1936 suspenders are used. These suspenders helped to distribute the weight of the belt and its attached equipment. The shoulder supports are rather thin and felt brown padding was often slipped onto the webbing. Hooked to the suspenders is the M1936 "Musette" bag. This is a general field bag issued to officers, drivers or other personel with special duties. 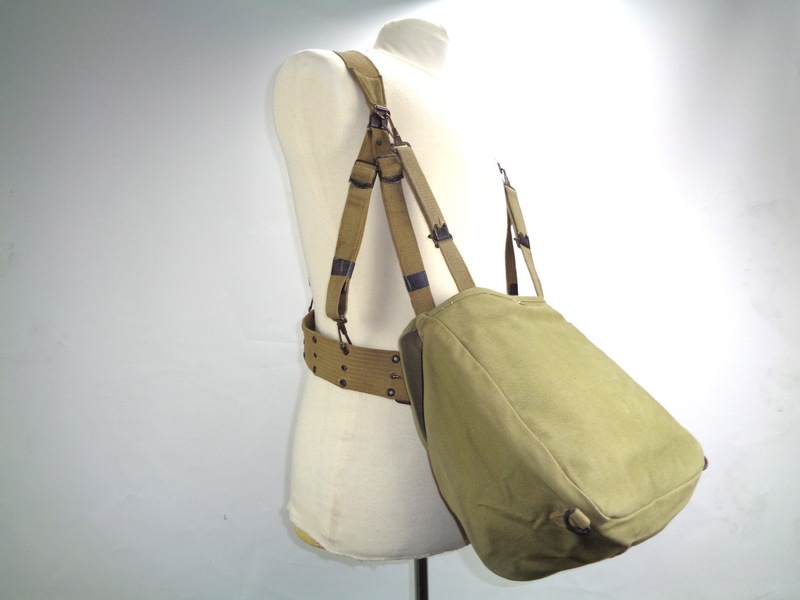 This field bag was ideally suited for the new airborne troops. The use of the bag with its accompanying suspenders can be little tricky. The suspenders are designed to function as separate shoulder straps for the Musette bag. Additinally they function as a harnas for carrying the weight of the belt with equipment. In reverse lend-lease american equipment was made in the UK and differt slightly in material from the US made items. When re-equiping the troopers after Normandy items were also drawn from these British Made stock. This can be discerned from original photos. During parachute descent the bag was snapped to the D rings of the M1936 suspenders and hung backwards in front of the trooper. As is clearly illustrated in Holland episode of the "Band of Brothers" show, that when troopers hit the ground they removed the parachute harness and flipped the musette bag over their heads to their backs. This is how the bag hangs in front of the paratrooper when jumping. When doing this, the bag is still only hooked to the front of the suspenders. The weight of the fully packed bag would pull the front of the suspenders up, which in turn would pull the belt up. After clearing the drop zone troopers would clipped the two outer front straps of the suspenders to the lower D rings on the musette bags. This would secure the bag and distribute the weight of the bag to the suspenders onto their shoulders. When flipped over the head, the bag tends to pull up the front of the suspenders. Some reenactors have their musette bags only hooked to the front of the suspenders and are practically dragging their musette bags around. 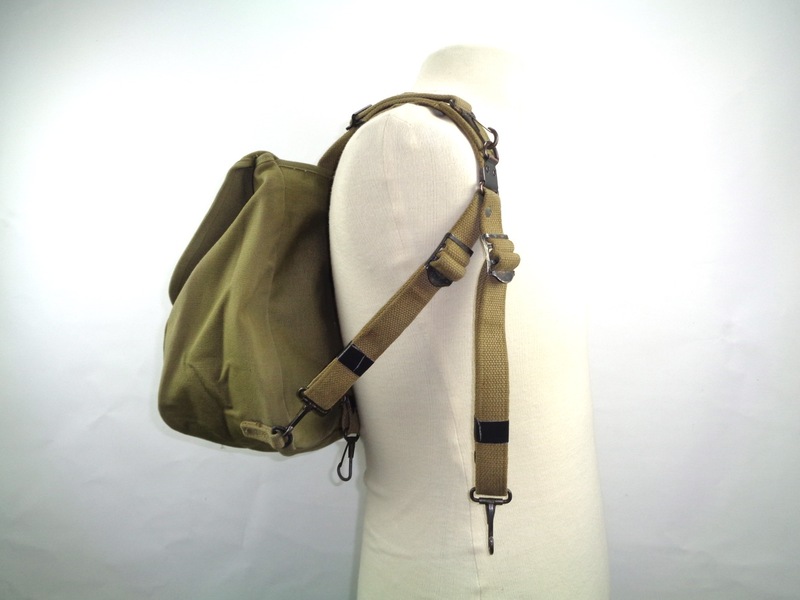 Or the bag is carried by reenactors with the shoulder strap for convenience. This was rarely done by the troopers in the field. Some mussette bags have a tab with two grommets on the front, this is a late war feature and none were used in combat. Although the 82nd were issued the light weight gas masks (M3) in their canvas carriers (M6), the 101st were (re)issued the M5 assault gas masks. These assault gasmasks were carried in a black rubberized bag (M7) that had a strap attached to each corner. The bag was ussually carried with one strap around the waist, resting on the thigh. The opening facing forward. WW2 bags had four chrome snaps, the post-war version had three visible lift the dot snaps. The two types of gas mask bags used in Holland. Top two bags are the M6 bags showing the front and the back and the variety in color. Below are two M7 bags, one opened (left) and one with the opening folded over and snapped shut (right). Troopers that did got the light weight gas mask discarded the mask at the first oppertunity and used the M6 bag as a carry-all. It appears that the entire 101st Airborne Division was issued the M5 mask. Glider pilots seem to use either types. Another trade of the the paratroopers is the M3 trench knife. Although this knife is a general issue item, it is mostly known for being used by the paratroopers. Traditionally the airborne troops strapped the knife in its sheath to their leg. Two types of sheaths were used in WW2, the early leather M6 sheath and the plastic (with a webbing belt loop) M8 sheath. In Normandy the M6 sheath appears prevalent, but when worn or damaged the M8 seems to be issued. Occasionally the later M8A1 with its wire hanger is seen in photographs. The tips of the M8 and M8A1 sheaths were reinforced with a metal tip in the post-war period. 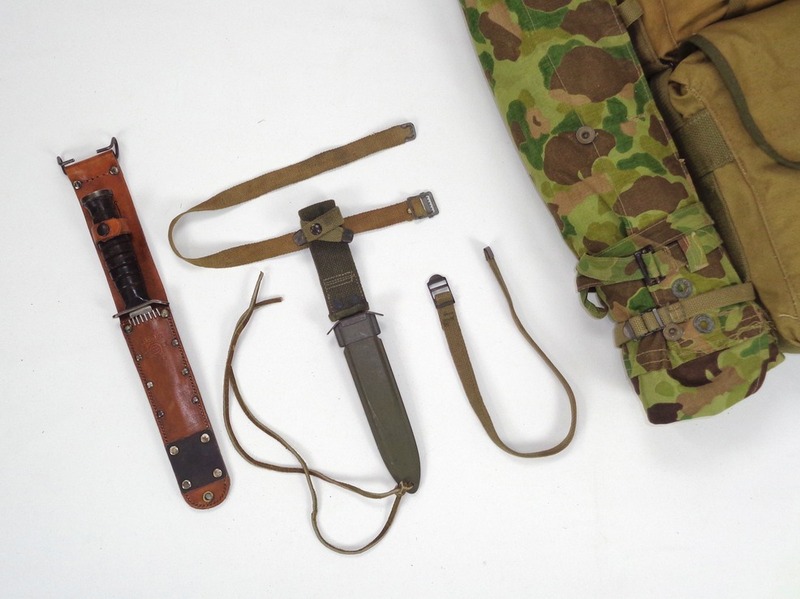 L to R: M3 knife in a repro M6 sheath, M7 sheath with leather thong and leg strap taken from a field cot, and an USMC pack strap with its intended use shown next to it. When worn on the leg the sheath was tied to the lower leg. The tip of both types of sheaths had a hole through which a leather thong went and was tied around the ankle. Through the belt loop any kind of strap was used and was tied around the calf. This could be a spare boot lace, piece of string or rope, or even a rag. A widely used strap, however, is one of the straps taken from a folding field cot. The earlier field cots ware white and these white straps can be seen in original photos. Tourniquettes were used sometimes, but being an medical item, these weren't readily available. 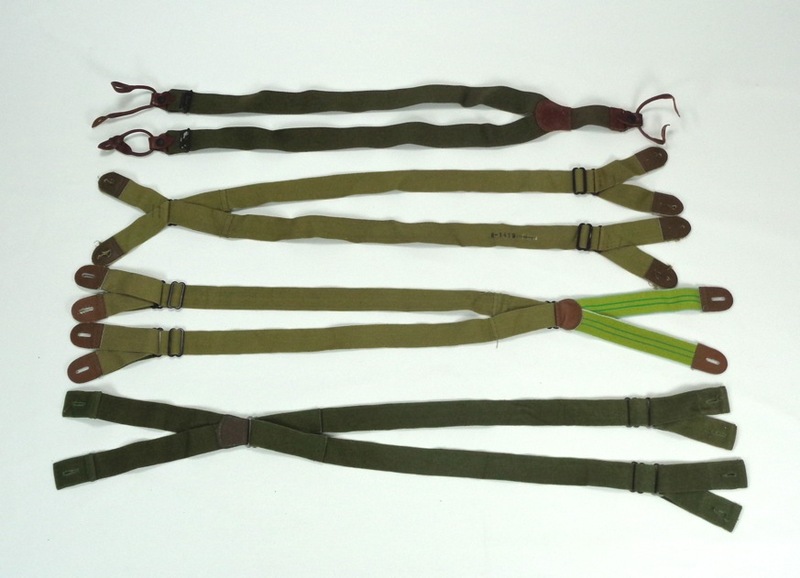 Short 18" straps are often offered as "paratroop leg" or "general purpose" straps. Obviously these are too short for any general purpose use. These straps are actually USMC pack straps for securing the tent roll to the marine's field pack. Obviously none were acquired by any troopers in the ETO. The knife was worn on the belt as well. 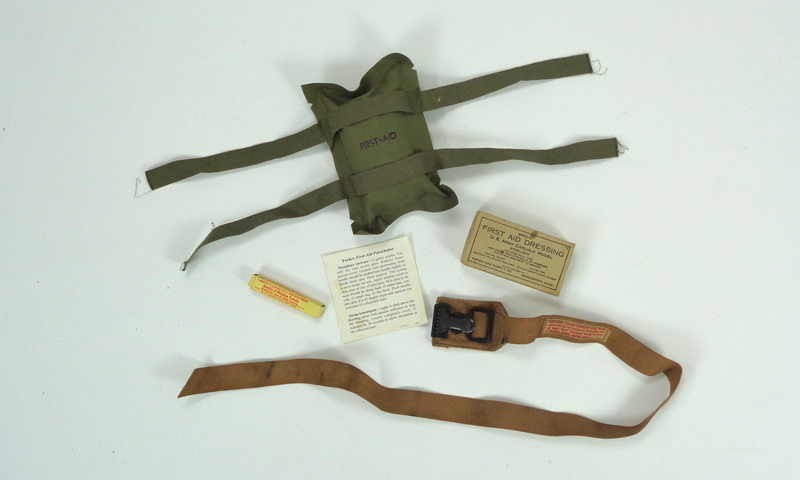 Developed for the Air Corps the 1st aid kit was a standard issue to the parachute troops before a combat jump. This small waterproof pouch could be tied to equipment with its four fabric tapes. In this pouch there was a standard field dressing, tourniquet, and a morphine syrette along with an instruction sheet. A reproduction Parachute First Aid package is shown here with its contents: A box that held a small morphine syrette, an instruction sheet (repro), a first aid dressing in its carton and a tourniquet. 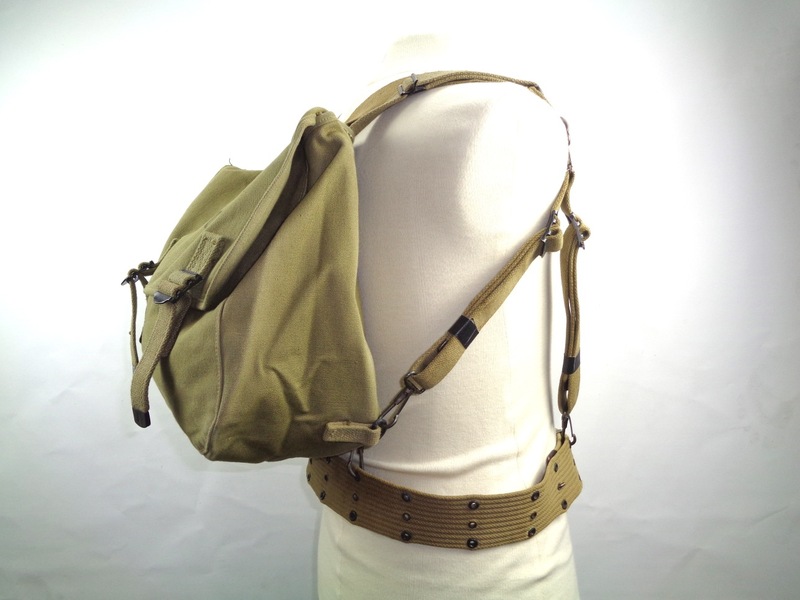 This pouch can be seen tied to any equipment (suspenders, belt, shovel, et cetera), an arm or leg, and sometimes to the shoulder loops of the M43 jacket. Some troopers tied the 1st aid kit to the netting of their helmets. It appears that this was standard practice with the 502nd PIR. Probably this was done for easy recognition during initial combat right after the jump. 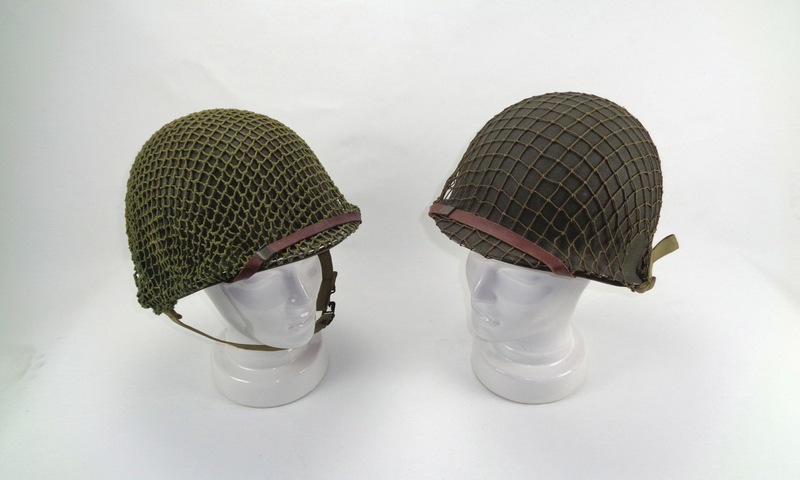 The 17 Airborne Division was ordered to tie the kit to their helmets for the Varsity Operation so that the British soldiers could easily distinct the American helmets from the German helmets in the early dawn hours of the assault. Along with the Parachute First Aid Kit British field dressing were issued as well and can be seen tied to equipment, uniforms or helmets. Initially the paratroopers were issued the cavalry riding gloves made of horsehide. These were worn extensively in the early campaigns. By the time of the Normandy invasion the gloves were no longer standard issue and replacements that came in after Normandy didn't got these. Although leather civilian gloves were used by some, photographs of the Holland Jump show few troopers who wear the riding gloves. The wool OD gloves with leather palm were standard issue by now and can be seen worn against the cold. 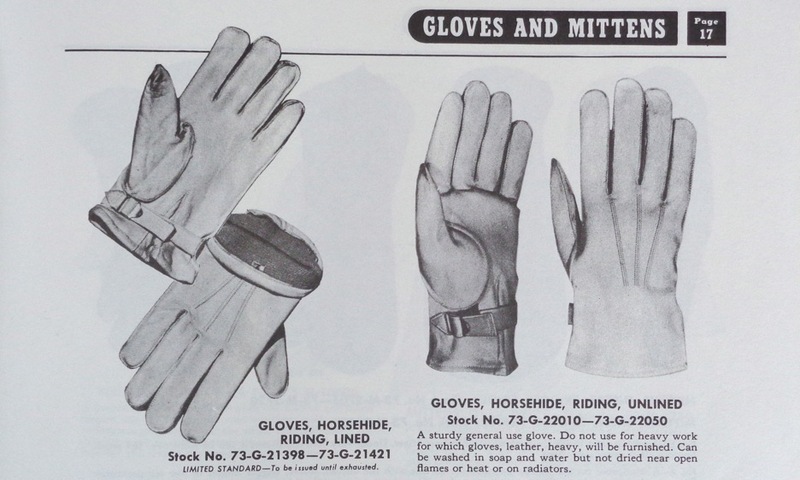 Cavalry gloves as illustrated in the August 1943 QM Supply Catalog. Extra equipment was added to the load of some of the troopers. This could be a wire cutter, compass pouch, ammunition bag, cleaning kit, et cetera. Generally extra equipment was carried by the individual who had to perform a specialized task. Some equipment was on organizational basis and one trooper was appointed for carrying this extra article. Extra equipment might makes a reenactor looks like a tough One-Man Army, but is usually overdone. Remember: Less is More! Please don't wear any goggles on your helmet. If you have to wear them use at least the M1943 cellulose acetate goggles. Soldiers carry arms. Riflemen carries rifles. The standard rifle of the US Army in WW2 is the M1 rifle, also called Garand after its inventor. U.S. soldiers, however, referred to this rifle as the "M1 rifle". The only external upgrade the rifle got after the war was a new tightening nob on the rear sight. Both the old M1907 leather and the new web M1 slings were used at the time of the Holland Jump. 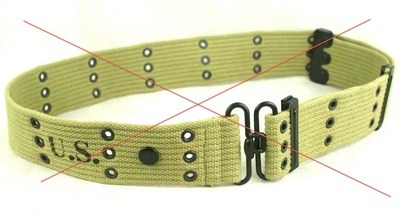 Don't put any en-bloc clips on the sling, this was seldom done and you'll probably gonna lose it anyway. Remember that the M1 rifle was carried port arms. A lot of reenactors run around holding their rifles like a modern assault rifle, with the muzzle pointing down. It's not a mine detector! Carbines were carried by junior officers and members of crew served weapons like mortars or artillery, or soldiers with specific tasks like drivers or cooks. A special version for the paratroopers was developed in 1942 and had a metal wire stock that folded sideways. This is the M1A1 Carbine. 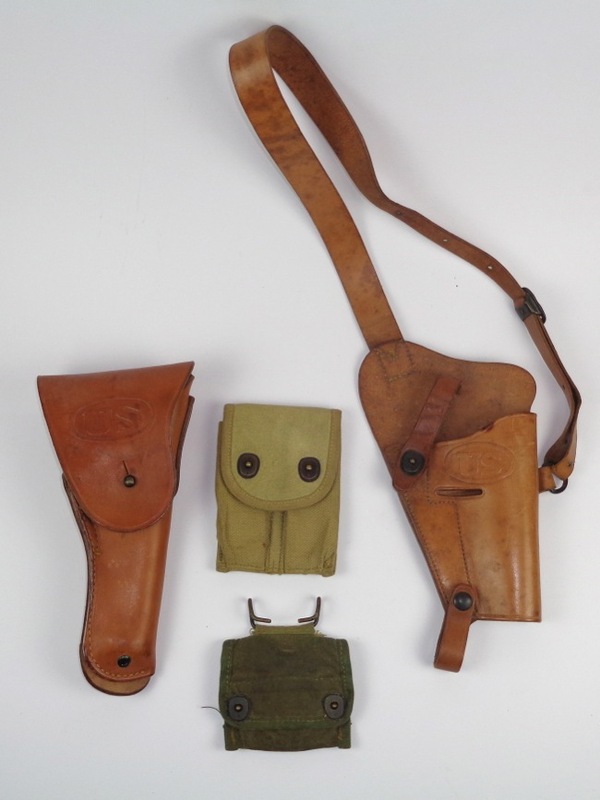 A special canvas holster for carrying the carbine on the pistol belt was also developed. Two M1A1 carbines are shown here. The top carbine is the correct WW2 model. The bottom one shows the post war rebuilt features: A bayonet lug, adjustable rear sight, the cut away wood of the stock showing the operating rod slide, and other minor details. Post war carbines have two distinct features that were developed during, but not used the war. Although a bayonet for use with the carbine was developed and issued late in the war, a provision for mounting the bayonet on the carbine was usually added after the war during rebuilt programs. So, please, remove that unsightly bayonet lug from those WW2 carbines. Late in the war a full automatic version of the carbine, the M2, was developed and standardized after the war. 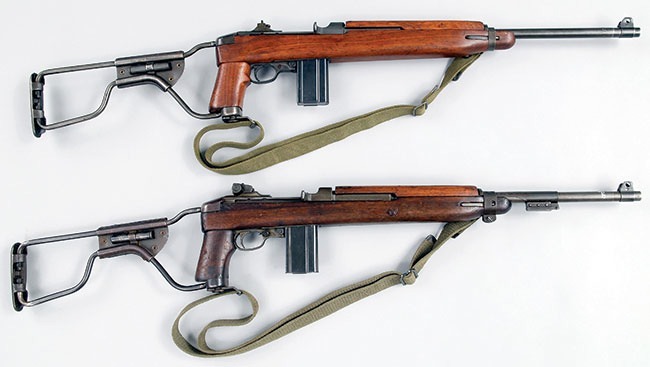 Regular M1 carbines were converted to M2 versions during post war rebuilt. (The "1" would be overstamped with "2" on the receiver.) M1 carbines sold to allies after the war were ussually unaltered. The original sight was a "flip" sight that could be set for 150 yards or 300 yards only. Later an adjustable sight was developed and made its appearance on the frontline during the last few months of the war in the ETO. The push through safety button was replaced with a rotary switch at the end of the war. The stock, both full and folding types, covers the operating rod slide. Late war production has this part cut away, as was done during rebuilt programs. Only the short 15 round box magazines were used in WW2, the curved 30 rounds magazines are post war, as are the bandoleers with the ten round stripper clips. Three variations of the Thompson submachine guns were used: M1928A1, M1 and the M1A1. Since the Thompson was declared limited standard during the war, there were no improvements developed for the weapon. Usually a Thompson submachine gun is good for reenactment as its is found. A cheaper replacement for the Thompson gun was developed and standardized as the M3 submachine gun. This weapon was made of stamped sheet metal with only the bolt and barrel made of machined steel. It was immediately nicknamed the "Grease Gun". The M3 has a distinct handle on the right side for retracting the bolt. An improved version did away with the handle and the weapon is cocked by putting a finger in a hole in the bolt to pull back the bolt. Adopted as the M3A1 it went to late into production for use in WW2. 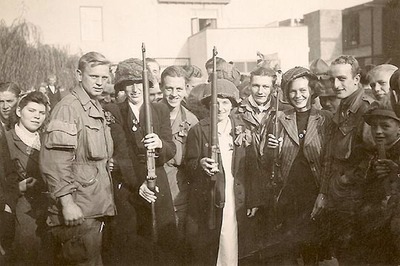 All types of the Thompson submachine guns and the M3 submachine gun were used by the paratroopers. 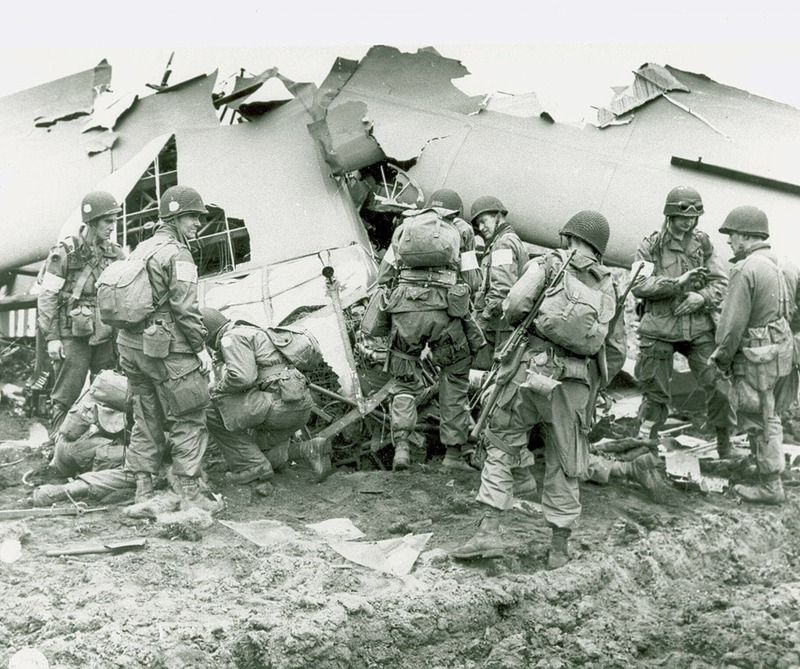 Although it might look like that all paratroopers were carrying a .45 pistol, they were only issued to senior officers, machine gunners and other specialized personnel. Many trooper "aquired" one in the field. A pistol is of great comfort in combat and some troopers beg, bought, borrow or stole the .45 from air force personnel. The pistol was carried in its M1916 holster or in the M3 shoulder holster. Each Parachute Infantry Regiment has a medical attachment. This was a medical unit permanently attached to that regiment. These units provided for medical care at the frontline and for initial medical care and evacuation. All three battalions had a medical unit that acted as a battalion aid station. Each company had two or three medics from this unit attached that usually became an unofficial members of that particular company. The medics of the regimental attachment were part of that orginization and used the same helmet stenciling as the rest of the regiment. In the case of the 506th this was the spade marking with its corresponding tic. 101st troopers and medics at the crash site of two gliders. An airborne medical company was attached to the 101st Airborne Division, the 326th AB Med Co. This company was responsible for evacuation of the wounded from the battalion aid stations to divisional collecting stations from where the wounded were transported to field hospitals. Members of the 326th AB Med Co. used a small white cross on the sides for helmet marking. Again, no red crosses in white circles! Initinal frontline evacuation was done by litter, from there the versatile jeep took over. 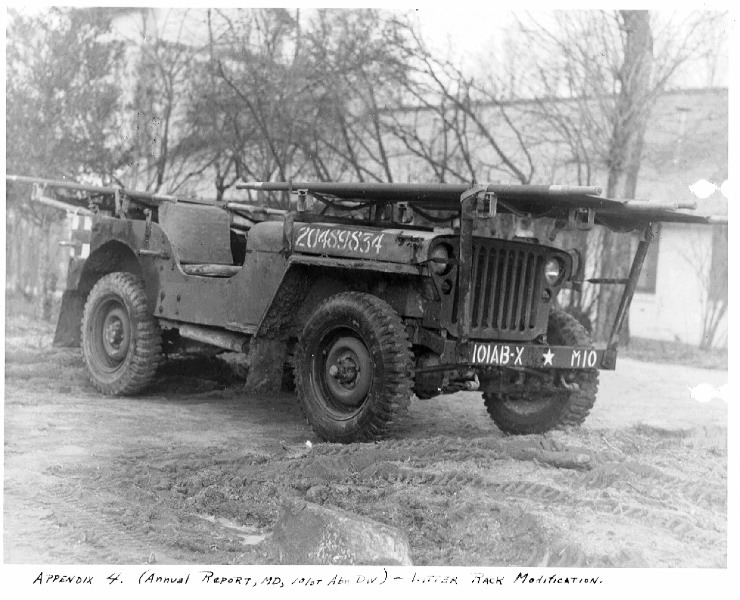 The 101st AB used specially converted jeeps for the transportation of the wounded. Since the jeep could be delivered by glider it was part of the operation from the start. Airborne medics usually carried only one medical bag with its bottem extended. One litter carrying strap was used to carry the bag slung over the shoulder. The other bag and the special medical harness, called yoke, was not used. Aidmen of the 101st normally wore two red cross armbands, one around each arm. Chaplains were part of these medical units. And last but not least, haircuts and eyeglasses. In the 1940's citizen soldiers wore their hair just like everybody else at the time: conform the 30's/40's fashion. The sides and back (nape) of the head were close cut with longer hair on top that was combed in shape. No beards! Only a few airborne units sported a mohawk. 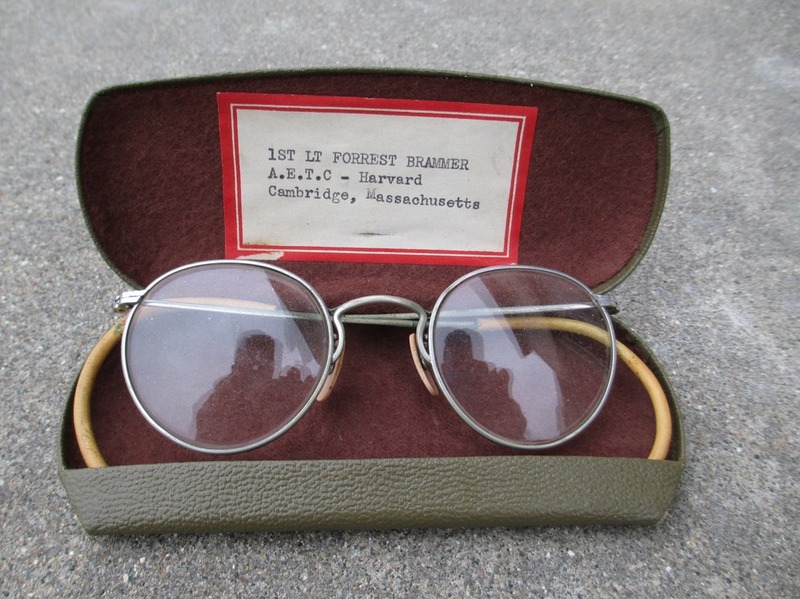 The eyeglasses worn in the military were of the Ful-Vue type with the wrap around legs. Either chromium plated or gold filled. These were taken from commercial stock. Note that the lenses are of an oval shape, not round. The legs are attached high up, not on the centre of the frame. For the paratroopers you needed to have 20/20 vision or you were out! Glidertroopers and specialist (jump) personnel, like surgeons, were allowed eyeglasses. You can either try to find a pair and have glasses of you perscription inserted in the frame, or you try contact lenses. Modern eyeglasses usually looks out of place or just ridiculous.